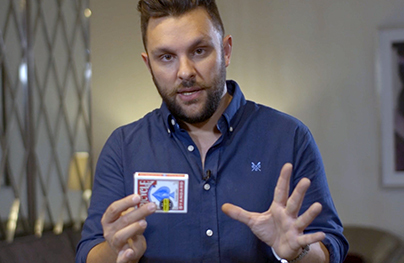 Being able to do a great deck switch is essential for any card magician worth their salt and soon you'll be treating the deck switch like just another sleight thanks to Real Deck Switches! On this new DVD you will learn 25 BRAND NEW switches which are all un-gimmicked, impromptu and require no lapping. Ben Earl has long been a master cardman and prolific inventor, and now he has turned his attention to the venerable deck switch, updating it for multiple environments. Thanks to his expert instruction and considerable skill, you'll soon be comfortable with switching decks under any conditions. Check out the trailer for examples. These switches look impossible, but they are not! They are well within the reach of any intermediate card magician. 25 brand-new deck switches, most unpublished before now! Visual decks switches and covert deck switches. Just think of the possibilities of switching from a shuffled deck to a memorized deck right under their noses! Real Deck Switches is ready to make the impossible possible and turn deck switches into a powerful new secret weapon for you. Order yours today! If you have never had much success with deck switches, this is worth the price many times over. What you are getting here is a variety of switches that are all related in technique to a a degree but all have different flows and feels to them allowing you to choose the best type for any given moment. Most of these are table switches while seated but he does offer several standing switches as well. The video is about 1hr 12 minutes and contains ZERO FILLER. Every second is used to teach something useful. Overall I found real value in this product and wound recommend it without question. Mr. Earl's technique, timing, and - particularly important for this topic - naturalness are very good. That's a lesson in itself. Out the roughly 70 minutes of instruction, over an hour is devoted to switches performed seated at a table. The ad claims that the switches require no lapping, and indeed decks are never dropped, or raked off of the table, to fall into your lap. However, in many of the switches the table edge is used to conceal decks both before and after the switch, so the feel and appearance of these switches is similar to lapping. A short segment at the end, under ten minutes, covers a few stand-up switches, which, notably, can be done without wearing a jacket. No routines or applications are taught, so this video is recommended if you already have one or more uses in mind for deck switches and want to find the best possible methods. None of the switches require any exceptional dexterity or coordination. However, most of the switches are best suited to confident, relaxed performers who have spent enough time in front of audiences to make their sleights flow seamlessly with their natural movements. If you're not yet comfortable performing, say, card-under-glass or gambler's cops, you might find the methods feel bold beyond your comfort level, or difficult to do without telegraphing your punch. But if you're ready to be a serious student of deck switches, this is required viewing. Ben, thanks for working on deck switches! Very detailed. Natural switch movements. Next step is to go out and try it. You only need one deck switch. The tutorial is a menu of switches. Order one and master it. Highly recommended. It is a rare thing to have an instruction video that is clear, precise and meticulous. Ben Earl's instructions make these switches easy to learn. His advice on how to perfect them is invaluable. His sense of timing, his attention to detail and his style of repeating the moves several times all facilitate learning and inspire creative thinking about all the different applications of these techniques. Beautifully done!! I attended Magic Live and Benjamin taught one of these switches, sitting with three other full time (and well known) pros, we unanimously agreed that JUST THIS ONE METHOD was worth the price of the convention. I've been anxiously waiting for this release! As a full time worker, and someone who does several deck switches in the first 10 minutes of my show, this is invaluable for me. I seriously wish this was ONLY available to individuals on a private tutoring basis! Ben is a genius who is really a class above most cardmen on the market today. Definitely would recommend and very practical!